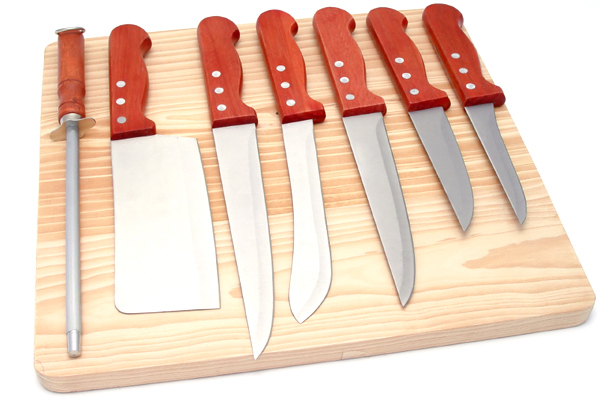 A good arsenal of knives can be a great asset to your kitchen, but which ones are must-haves? You don’t need to have a full butcher’s block of knives at your disposal, but do keep your kitchen up-to-date with these essentials. A knife in the kitchen can be your best friend or your worst enemy. Keep your friend close and your enemy at bay by selecting your knives wisely. Choose sturdy, well-built, forged steel knives that feel balanced in your hand. Think a sharp blade is dangerous? Think again! A dull knife is much more dangerous than a sharp one and will result in more injuries, so keep your knives sharp, and that will help them do the job they’re designed to do, which is cut up food — not hands and fingers. Take special care of your kitchen friends by handwashing only then drying them immediately to prevent rust and a dull edge. Keep the edge smooth and sharp with the regular use of a honing steel and knife sharpener. The chef’s knife is a must-have for every kitchen. It’s an all-purpose workhorse of a knife that will undoubtably be the most used knife in the kitchen. To keep this your go-to favourite, opt for one with a 7- to 9-inch blade that feels balanced and solid in your hand. It can be used for many purposes, such as chopping vegetables, slicing meat or cutting up a fryer chicken. A paring knife is probably the second most-used knife in the kitchen, following close behind the chef’s knife. Typically the blade of a paring knife will be anywhere from 3 to 5 inches long, although the length of blade is a personal choice, and comfort is the key when adding this to your kitchen. The smaller scale of this knife makes it perfect for several, more detailed tasks such as paring, peeling vegetables, creating garnishes and trimming fruits. An essential list of knives wouldn’t be complete without including one with a serrated blade. The long, thin blade of a bread knife is a popular choice, but so is a serrated utility or tomato knife. To maximize the use of your serrated knife, choose one that is 8 to 10 inches long. This type of blade is well suited to slicing breads, tomatoes, citrus fruits and anything else that requires you to make a smooth slice in a single stroke. Those are the three essential knives every kitchen needs. Use them to let your culinary goddess shine through!